PAVILLION — Three scientists say groundwater pollution in Pavillion is likely caused by gas seeping from inadequately lined gas wells, a porous geology and the dumping over years of up to 880,000 gallons of chemical effluent into 40 unlined pits. The two likely sources of pollution — contamination that includes methane gas and other petrochemicals — have affected the Wind River Formation drinking aquifer to the point it’s unlikely to ever be cleaned up, one scientist said. The three made their cases at a forum sponsored by the Powder River Basin Resource Council in Riverton on Oct. 18. The tainted water affects homes and ranches in the 12-square-mile Pavilion gas field where about 169 gas wells were drilled. 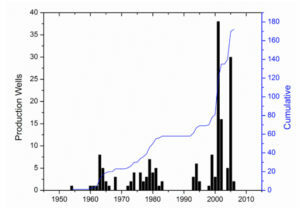 Activity that started in the 1950s increased in density and rate starting in 2000. 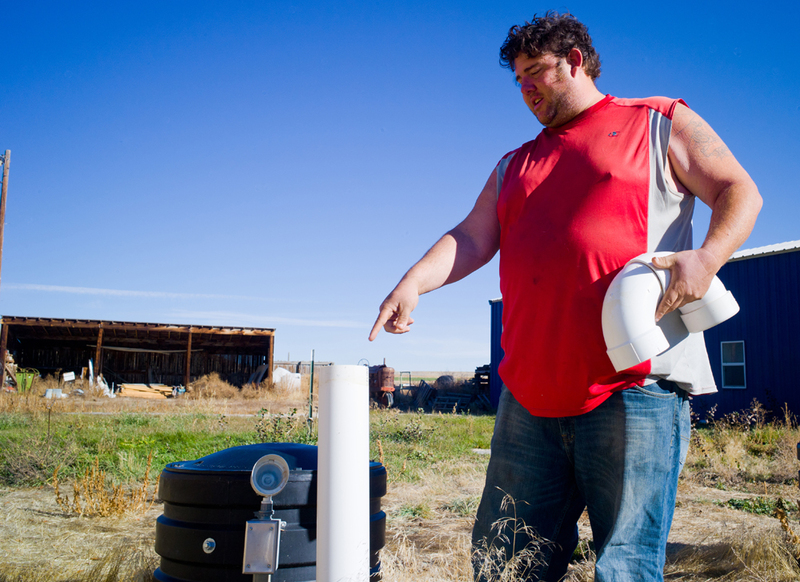 Thirty-seven private water wells have been surveyed for pollution and about 30 homes are now being served by recently installed cisterns to which clean water is regularly trucked. The scientists, two former federal Environmental Protection Agency experts and a hydrologist specializing in wells and pollution, spoke for almost three hours in an update of the decade-long, contentious investigation into Pavillion groundwater contamination and the tainting of domestic water wells. They included some of the latest information provided by the DEQ to residents and conclusions expected to be published in a peer-reviewed scientific journal. At issue is the source of pollution and responsibility for it. The three sought to answer whether hydraulic fracturing, the disposal of petrochemicals in unlined reserve pits, and the inadequate construction of gas wells polluted the 3,000-foot-thick Wind River Formation aquifer and/or individual domestic water wells. Their examination is independent of the state’s efforts to make sense of the tainted water. Former EPA groundwater expert Mike Wireman, one of the three expert speakers, pointed to a logical solution to the controversy. It’s his belief the aquifer will never be cleaned up, he said. On a sunny fall morning, Pavillion rancher Jeff Locker guides his pickup along dirt roads, pointing out gas wells, the sites of unlined reserve pits where diesel-based drilling mud and petrochemicals were dumped, and the fields of a late neighbor who recently died of cancer. The effects of the pollution continue to dog the community. Rhonda Locker, Jeff’s wife, suffers from neuropathy he believes is caused by pollution and her health is deteriorating, he said. They moved from Pavillion to Riverton and their son Eric, a trucker, now lives on the tainted ranch. The Lockers settled their lawsuit against gas-field owner Encana early this year. 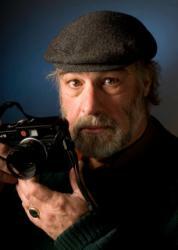 The settlement limits what he can do, say and write about the dispute, Jeff Locker said. And that’s not much. “The matter has been resolved,” Locker says in downtown Pavillion, a location marked by the fire house, the town sign and a wellhead. Two 2,000-gallon water cisterns supply Eric and his two dogs with enough water for about three months. Every now and then a rig from Bullington Trucking stops by and tops off the tanks buried just outside the home. 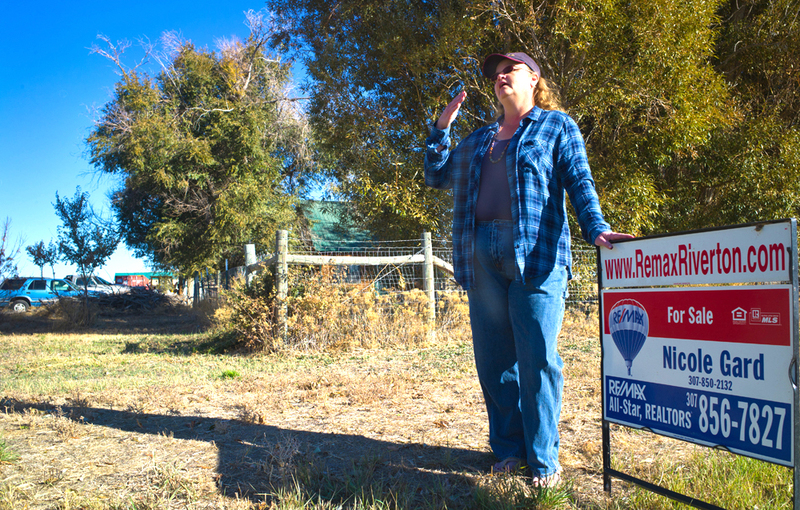 Down the road a bit, Jennifer Murdock’s dogs guard her ranch house that is marked by a red, white and blue real estate agent’s sign. She and her family bought their 165-acre ranch in 2004. After raising two sons who are now Marines, they want to move on to help one raise a son of his own. Their artesian well flows clean, supporting 240 head of cattle, 45 horses and seven people. It creates a backyard skating rink when it overflows naturally in winter. “That’s a lot of water for an 85-foot well,” she says. A prospective buyer agreed, and the couple was ready to move on to a new life as helpful grandparents. Why? “Because you’re in the contamination zone,” she said she was told. Despite water tests that came out clean, tests that reported “everything is fine,” Murdock said, “we still have stigma we’re dealing with.” She and her husband are in real-estate limbo until the next DEQ and EPA report comes out, perhaps at the end of this year. Evelyn Griffin, a teacher in Washington state and Wyoming for 42 years and a Pavillion resident since 1965, said she lost her sense of taste and smell when oil and gas activity picked up. She’s learned to use a lot of ketchup and hot sauces on her food, she said, but worries about not being able to detect smoke. 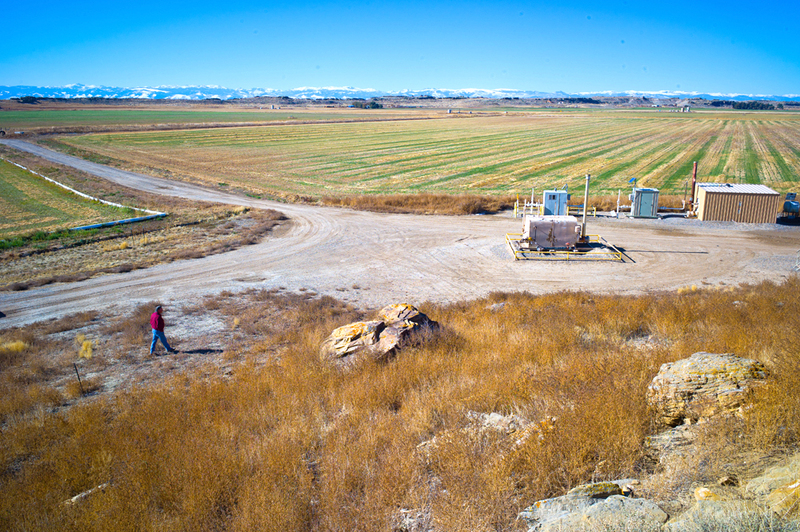 The 3,500-foot-thick Wind River Formation aquifer from which Pavillion and nearby residents draw their water is a uniquely sensitive formation that’s also a source of gas, said Susan Spencer, a hydrogeologist and wells expert with Weston Engineering in Laramie. In 1992 Locker began seeing problems in his house; “Black slime in his toilet … his water was smelling bad, tasting bad,” she told the audience. Fortunately for scientists, Locker had had his water well tested four years earlier in 1988. The results were “fairly good,” with one general measure — total dissolved solids or TDS — registering 532 milligrams per liter, she said. When Locker later complained of black slime and foul odors in 1992, that TDS reading had shot up “by a factor of 10 times,” Spencer said. The count was now 4,600 milligrams per liter. The Wind River Formation is “a really complex geologic environment,” made up of various layers of sandstone, shale and mudstone from ancient stream and lake deposits, Spencer said. Domestic wells generally tap underground water-bearing pockets within a few hundred feet, if not less, of the surface. Deeper, there are pockets of mixed gas and water and deeper still, commercial concentrations of gas. The Pavillion gas field is made up of vertical conventional wells — those drilled straight down that didn’t employ modern, horizontal drilling techniques. They were completed at depths ranging from 900 to more than 5,000 feet deep, sometimes using hydraulic fracturing to free gas that is tightly bound by the source rock. There’s no impermeable geologic layer that protects shallow drinking water deposits from deeper gas, including gas found in the Fort Union Formation that underlies the Wind River aquifer, she said. Officials recognized as much in 1994, she said, when the DEQ, state Engineer’s office and Wyoming Oil and Gas Conservation Commission signed a memorandum. “No construction or action which is not protective of surface and groundwaters … shall be authorized,” the memo reads. “Everybody signed the document but from what I can tell nobody paid attention to it,” Spencer said. Support fact-based journalism. Become a supporting member. The Powder River Basin Resource Council said it invited representatives from the federal Bureau of Land Management, the Wyoming Oil and Gas Conservation Commission and the Wyoming Department of Environmental Quality to its forum, but all declined. Two representative of Encana attended but did not speak. To protect groundwater in geologic environments like those underlying Pavillion, drillers must seal off the sides of their bore holes to prevent gas in lower zones from moving or migrating to the drinking water resource. That’s done using steel casing or cement. More than half the Pavillion field wells — perhaps as many as 90 — were drilled without sealing the bore hole in a manner that would prevent stray gas from seeping out the sides as it travels up through the different layers, Spencer said. Gas drilling has been going on in the Pavillion area since the 1950s Spencer said. In the early 2000s, regulators allowed the density of wells to increase from one per 640-acre section to up to 32 wells per section, she said. The gas wells passed through, and likely connected, pockets of gas-laced water with pure-water bearing parts of the Wind River Formation above, she said. Those intermediate pockets weren’t the target of energy companies, the scientists said, but may have played a role in the troubles. “It’s just a concept because we don’t have a lot of data to tell us what’s going on,” she said. “When you drill through them, you disturb them,” Mike Wireman, a hydro-geologist and former EPA groundwater expert, said of the intermediate pockets. He is now president of Granite Ridge Groundwater, a consulting firm in Boulder, Colorado. “You don’t produce from them, but you disturb them. Fifty-two percent of the Pavillion gas wells “have some kind of a construction problem,” he said. “That allows these pathways. That’s about 80 wells, 90 wells. Had the methane migrated naturally through the formation over geologic time, methane readings would have been uniform. “That process kind of evens out,” he said of a natural event. “But now we see lots of variation,” just the opposite of a geologically natural distribution of the gas. The bacteria in question “they eat methane,” he said. “That’s what keeps them going.” He likened methane flows to “the Safeway truck rolling in.” The bacteria “get a big dose of food,” he said. Smelly hydrogen sulfide is a byproduct. “The state has to make sure these wells are constructed in a manner that safeguards the water and I don’t believe that has happened,” Wireman said. Regulations require that steel “surface” casing — a method of sealing the bore hole — be placed to a depth 50 feet below the aquifer. 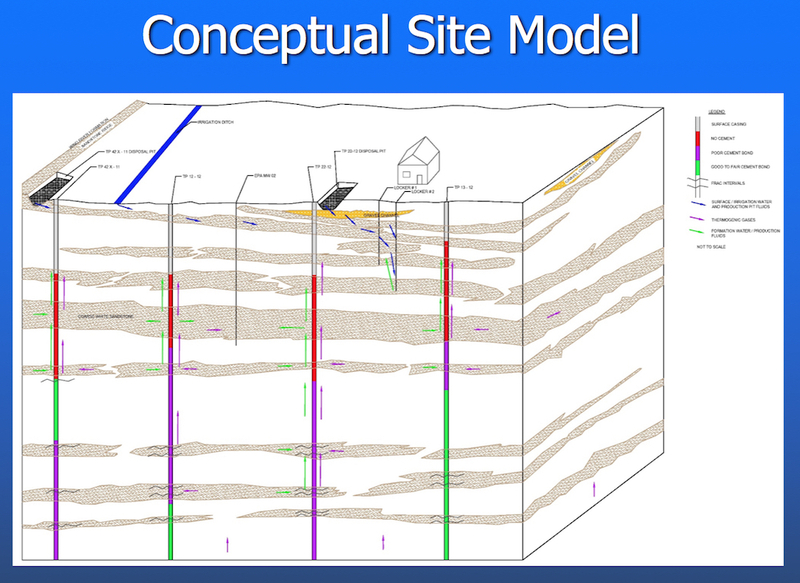 Instead, regulators and drillers interpreted that to require casing only 50 feet below the deepest water well. So instead of extending 1,000 feet deep, casing might extend only 100 or a few hundred feet, he said. From a “protect the public point-of view,” that protection should have descended 1,000 feet, he said. As part of the drilling process, many drilling rigs employ surface reserve pits into which various chemically laden fluids are poured. About 40 unlined pits have been employed in the field, said Dominic DiGiulio, author of the much-debated 2011 preliminary EPA report. That report was never finalized, critics say, because of political interference by the state, the EPA and the industry. DiGiulio left the EPA to continue work on the issue and effectively completed the report in a scientific paper that upheld initial pollution findings linking oil and gas activity, including fracking, to groundwater contamination. Industry and regulators challenge those findings. In Spencer’s view, “DEQ took [the study] over and somehow it turned from being a groundwater investigation into a palatability study,” she said. “And all that consisted of was resampling 13 of the worst domestic wells and trying to tie the problem to the wells themselves – to bacteria that might be present in those wells. Or other problems that might be caused by septic tanks,” and other factors. “So basically the investigation into the cause of the groundwater contamination — widespread — in the shallow aquifer and deeper … was totally derailed and nobody wanted to look at that again,” Spencer said. Again, industry and regulators contest that perspective and regulators continue their probe. DiGiulio focuses in part on drilling mud, the fluid used to carry borehole cuttings to the surface and out of the hole. As part of the drilling process, drillers pumped it into the unlined pits, he said. Locker visited the site of one unlined pit, since filled, the day following the PRBRC forum. It had been about four feet deep, contained by a berm perhaps two feet high, he said. It once held produced water, he said — water from the gas well containing petrochemical byproducts. Drilling mud through 1984 was diesel-fluid based, DiGiulio said. Gas well “completion reports” filed with regulators when wells are finished show that the drilling mud contained between 55 percent and 79 percent diesel fuel during that period, he said. Fracking became widespread in the 1990s and “took off” after 2000, he said. To free gas tightly bound in the formation, hydraulic fracturing employs a mixture of fluids, sand and chemicals pumped under high pressure into the pay zone. About half the “stimulation fluid” might come back out of the drill hole and would have gone into the pits as well. Twelve million gallons of stimulation fluid were used in the field, according to calculations made from completion forms, DiGiulio said. About 350,000 gallons came back out of the gas wells and went into the pits, he estimated. In later development years through the late 1990s, produced water — tainted water that comes out of a gas-bearing formation — also went into the pits. Unlined disposal pits definitely polluted groundwater and data suggests they also affected domestic water wells, he said. Gas likely migrated from production wells into the Wind River aquifer, he said. 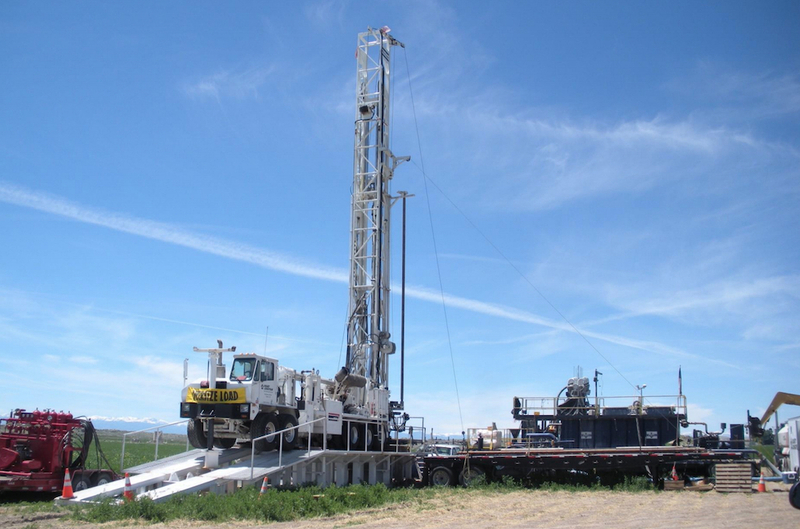 In many cases, it seems that migration from production gas wells also has affected the domestic water wells, but “it gets kind of hard to connect the dots,” and make a rigorous scientific conclusion, he said. DiGiulio believes fracking impacted groundwater below 1,000 feet, DiGiulio said. He could not say definitely that fracking impacted domestic water wells, however. Many persons, Wireman said, improperly seized upon fracking as the principal or sole culprit of the water-well problems. The state, through the Oil and Gas Conservation Commission, is in the process of trying to clean up some of the 54 unlined pits, DiGiulio said. Excavation of tainted soils is part of the process, but the scientist said he believes the program falls short. Seven pits are not even recognized as part of the field, he said. Only 12 of 45 pits, DiGiulio said, are being dealt with under “defensible criteria,” or with measurements and calculations that would meet clean-up regulations. “A properly calculated criterion would have resulted in more excavated soil,” he said. In some of the testing, investigations and remediation stopped when excavation reached groundwater, he said. “There are a number of pits that were very highly contaminated — lots of soil was excavated but no samples were ever collected of the groundwater.” If groundwater had been sampled, there would be a “good chance” a more extensive cleanup would be required, he said. Only nine out of 34 pits where production fluid was discharged have been adequately investigated, he asserted. Only one out of 20 pits used for diesel-fluid-based mud were properly probed, he claimed. Statistical analyses show a pretty strong correlation between what was disposed of in the pits and what turned up in nearby domestic water wells. “There’s something going on in these people’s wells and it’s likely due to these unlined pits,” he said. Today, Encana is addressing action items in earlier reports, including plugging some gas wells under the supervision of the state oil and gas commission and BLM, according to emails from state regulators to the PRBRC. Investigations and cleanup continues at some of the unlined pits. Encana pays for water supplied to residential cisterns, residents said. Wireman said regulators need to be transparent regarding the cleanup. “People have the right to know why those wells are being plugged and what the problem is with those wells,” he said. Sampling from domestic water wells in April and May — information that was relayed to landowners who then shared it with the scientists, is still being analyzed, a DEQ staffer told the conservation group in an email. For now, Pavillion residents await the conclusion of that and other investigations and recommendations that will result from them. Among other things, the continuing investigation is supposed to focus on six principal ranches believed to be most affected, residents said. The probe is to use shallow monitoring wells to calculate what might have spread from some of the unlined pits to nearby domestic water wells. Now, 26 years after Jeff Locker noticed slime and foul odors from his water well, residents wonder what recommendations the next iteration of the state’s probe “Phase 6” will bring and whether two deep monitoring wells drilled by the EPA will be abandoned, with the resulting loss of potential data. The DEQ says it will remain engaged. “If there are impacts to the quality of water, we’re going to be involved,” DEQ spokesman Keith Guille said. Angus what a great article. Very thorough and informative. Thank You for the fabulous reporting. A superbly lucid explanation of Pavillion’s water problems, all-too-long the poster child of the anti-fracking crowd.